Durga Bisa Yantra for Luck in Business and good health. 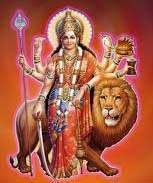 Durga Bisa Yantra is of Shri Durga Ambe Maa. It is carved on gold, silver or copper and is worshipped through Beej mantra and yields good results. It is a powerful yantra for attaining desires, to remove difficulties and to conquer enemies are the special effects of this yantra. If one prayes for a paticular wish in front of Maa yantra, Maa Ambe fulfill the wishes of the person. It bestows wealth and property and protect the person from all sorts of dangers. Worship of this yantra as per Adhayaya 4 sloka 17 of Durga Saptashati removes poverty. It also indicates result when used in neck, arm or on body. It is most famous yantra in different forms and is very effective, provided it is prepared and puja is performed with kinds of flowers and put in the smoke of lamp lighted with black agar with rituals and full faith. A unique and best talisman for Durga Maa devotees. This talsiman shall definately be worm by people who remain sick or are very prone to infections and diseases. "JISKE PAS BEESA USKA KYA KAREGA JAGDISHA"
It is also called "Yantra Raj Beesa"
"Om Hrim Dum Durgayee Namah"